The Guardian calls our attention to how more car free communities would improve air quality and reduce deaths and illnesses related to air pollution. Car Free Day is a way to bring attention to this fact ("We can cut air pollution drastically right now. Here’s how"). The DC area has a "Car Free Metro DC" initiative but it isn't particularly visible. I'm thinking just as various neighborhoods and cities have festivals from Adams-Morgan Day to the H Street Festival in DC, and how I keep advocating for Bike Expos and such on the part of transportation departments and college campuses, besides "back to school" events and such, Walk to School Day in October, Bike Month and Bike to Work Day in May, etc., that sustainable mobility agencies and programs should organize an annual transportation festival in association with Car Free Day. 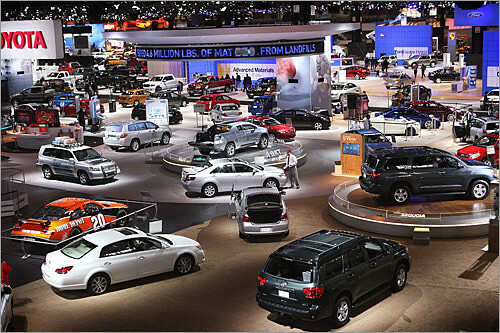 Think of it as "not the auto show." Although I'd call it "car light" and allow car sharing vendors to participate. Model it after Ciclovia/CicLAvia--Los Angeles County tends to get between 100,000 and 250,000 participants in their "Open Streets" events, which they move around to different locations throughout the county. 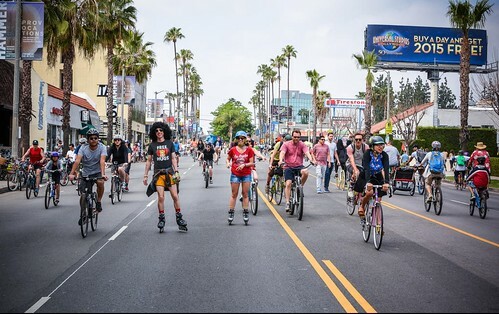 Cyclists and rollerbladers enjoy the streets during a CicLAvia event in the San Fernando Valley. Photo: Rob Rovira, March 22, 2015. But also in a very purposeful way, include focused exhibits on various elements of sustainable mobility--various transit modes, biking, walking, school and campus-focused programs, delivery programs, car sharing, bike sharing, scooter sharing, transportation demand management, trails and friends groups, etc. E-vehicles I'm not sure. It still promotes automobility. OTOH, you can get money from producers for sponsorships (same with car sharing). 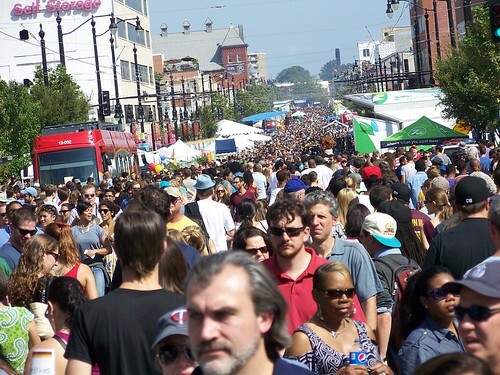 Arlington County, Virginia has done the expo part, with the Arlington Car-Free Diet program but not linked with "a festival." And social media campaigning. The two elements need to be combined into one. In DC, I've argued that Massachusetts Avenue, at the least from 9th St. to Dupont Circle would be a great place to do this as it would not impinge on any regular bus routes, is centrally located, is close to transit stations, and is highly visible. 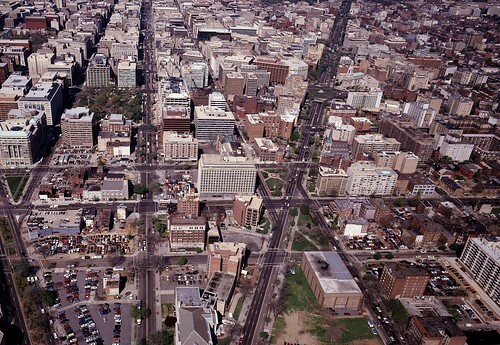 Aerial view of Downtown Washington,D.C., Massachusetts Avenue is in the center right of the photograph. Before the Metrorail system opened in DC, there was a "festival" on the National Mall, introducing Metrorail cars to the public. DC did this with the Streetcar c. 2007-2008. 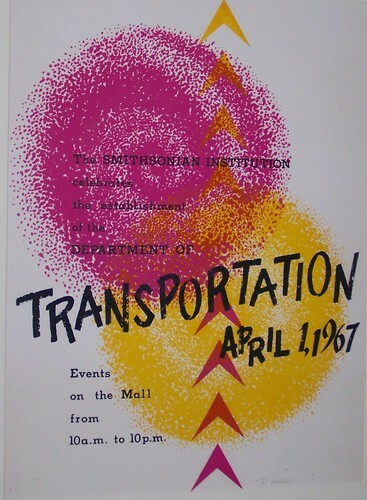 Poster highlighting the creation of the U.S. Department of Transportation, and celebratory events on the National Mall, 4/1/1967. There was a festival on the National Mall when the US Department of Transportation was created. But I think from the standpoint of "what have you done for me lately" ("A consultant told Metro what many riders already know: It's the service," Washington Post), sustainable mobility programs and agencies need to be more outwardly focused and marketing "all the time."